This year Elias wanted a ‘Magic’ birthday party. Not being a member of the magic circle myself I was thrown a little by how I was going to pull that off – so I started to brainstorm other possibilities with him – we decided upon a ‘Spy Party’ and I immediately got Pinteresting. There were so many brilliant ideas that I just knew this party would be fun to organize – and it really was but I did have to be more organized then I usually am for parties and with 8-year-olds I knew I couldn’t pull the wool over their eyes – the spy games would need to be good. First we sent out an invitation inviting his guests to attend Spy School. Included in the invite was a fake moustache (to ensure no one suspected them) and a Cipher Wheel to decode the secret password. I downloaded a template for the Cipher Wheel here and just ‘re-branded’ it a little. Arrival – Spies are given their identification tags (1) and scanned (2) to ensure they are not bringing any weapons into Spy School. 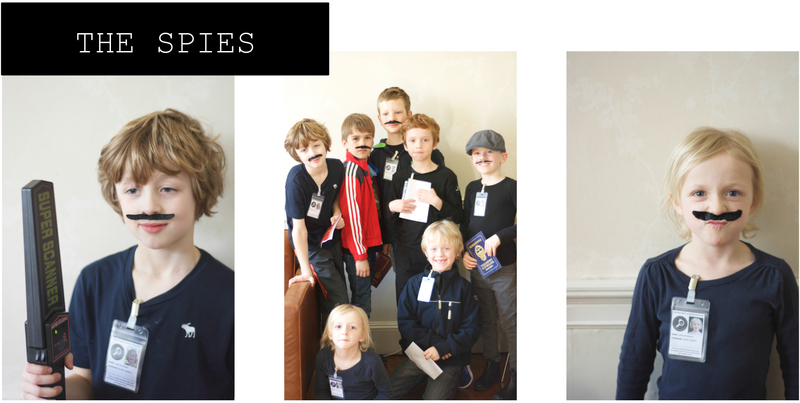 They then needed to choose a Spy Name by picking one word from one jar and another from another and then this was stuck into their ‘fake’ passports – I got these ideas from this great blog post and they even had downloadable printables! – Inside the passports was a list of the tasks they would need to complete – I stickered them as they passed each level (but actually I’d recommend using a stamp for that bit – the stickering was a little fiddly!). Task 1 – Observation: My husband had a lot of fun setting up a table with a Playmobil ‘scene’ on it – he tried to make it quite detailed. The kids were told to study the scene as they would need to observe if there had been changes to it later on. We set this up in our living room were we did the arrival and it was a great game for them to be getting on with whilst we waited for everyone. Task 2 – Interrogation: Downstairs into our cellar (usually a place for laundry but on this day it was Spy HQ!). Another idea from the above blog – each kid had a character, animal or famous person stuck on their backs – they had to walk round and ask each other questions to try and find out who they were – but the answers could only be yes or no – the kids found this one pretty hard and we had to give them some helpful tips but they all managed in the end. Task 3 – Code Creating and Cracking: We taught them a way to write a hidden message by writing or drawing something small with a light blue crayon and then scribbling all over it with a red crayon so you can hardly see the blue message. Then take a sheet of red acetate and hold it over the message and you will see the blue message clearly. They had to create a message – then swap with a friend and try and discover what had been written or drawn. Back to Task 1 – Now we went back to the observation table – in the meantime my husband had made 6 changes and they had to discover what as a team. They loved this one. Task 5 – Laser maze. 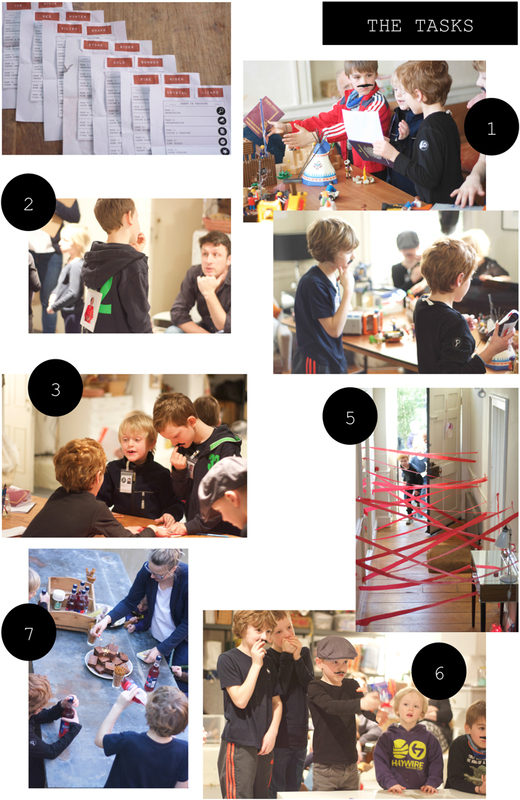 When the kids arrived back we made them wait outside the door and explained the next task – getting through a laser-maze without breaking it. Our hallway is a perfect corridor for this – we used red crepe-paper and washi-tape to create a maze for the kids to climb through – it looked great and the kids really enjoyed that surprise to come back to – tip if you do this: put some lasers very low down – the kids quite quickly worked out they could slide through underneath most of our maze. Task 6 – the controversial one … Target Practise. I have never bought these ‘exciting’ Nerf guns for Elias although whenever he goes to anyone’s house who has one he really loves them. I’m just a pacifist and don’t like boys playing war but … they do anyway – my boys often take sticks or their fingers and shoot eachother. I remembered how much fun I had with water-guns as a kid and knew that I would be making my son’s day if he got to have a play with some of those ‘exciting’ guns. So I bought the littlest one I could find (3) and a second one with a laser (4) (because that seemed quite Spy like) and we set up a small target (5) back down in the cellar – they all got a go with the laser gun first and had to try and score 100 points on the target and then they had a go with the small pistol – there were strict rules to not shoot at fellow spies and actually they all really enjoyed it. Elias had about 5 days of carrying these guns around with him after his party and now they are at the bottom of a toy box somewhere and don’t seem to be too exciting anymore – maybe he got the shooting out of his system for now! Task 7 – Bomb detonation. By now the kids were ready for some food and drink – I made chocolate brownies and ‘bomb’ biscuits and we put sparklers in the brownies to detonate them. (Whilst they were eating I sent my Dad and husband on a little mission to get something ready for the next stage). ● A clip board with a pen and paper with 7 boxes ready to input the numbers as they found them. ● A piece of fabric with 8 pins in it. ● A couple of code-crackers – A number code, an alpha code, a piece of the red acetate. …and this is where the genius of this task was – again credit due entirely to this blog who introduced me to QR codes and this generator. 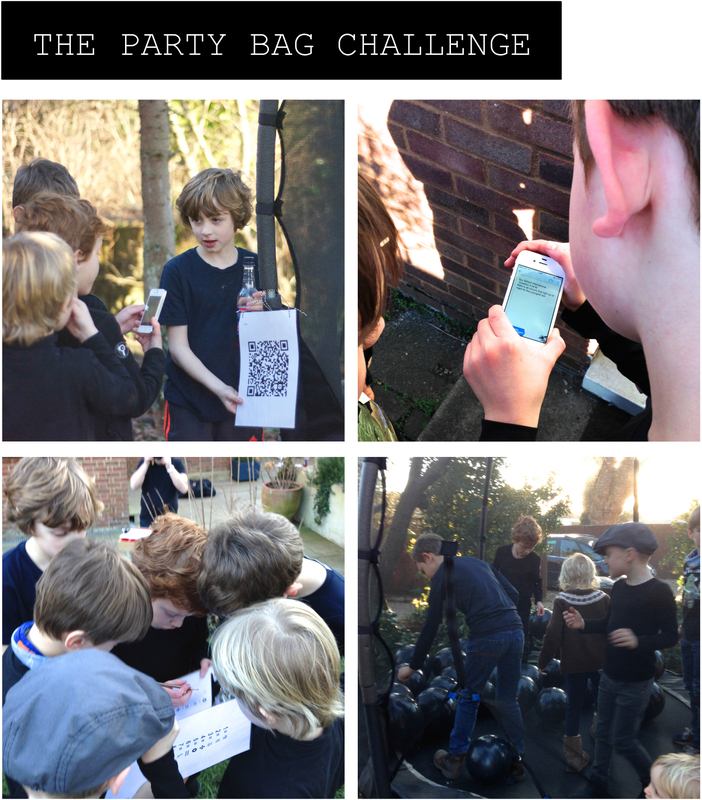 It was really simple to set up; I could just input the questions to our ‘treasure hunt’ and then fix the QR codes up so the kids could scan them to get their next clue – they felt like real proper spies!!! Just a little tip – when you create the codes I copied them into a document and printed them and just wrote at the top of each code where I needed to hang it – this won’t ruin the clues for the kids as it will only say the location they have already reached but it will help you to remember which clue to pin up where! At each location the kids got a spy task to crack to get the number and the next clue where to go. Most of these clues we did as code-cracking tasks but my favourite one (and this is what my Dad and husband were busy with whilst we ate cake) was the bomb detonation – we filled our trampoline with 50 black balloons and the kids had to pop them to find the number – it was a little scary having 8 kids on a trampoline holding pins but luckily no injuries and lots of fun! So they cracked the code and secured their party loot – each got a pair of spy-glasses, invisible ink pen, note book and some popping candy. We were shattered at the end – it was full-on but I think it was the most fun party we’ve ever done! (2) This scanner was not too expensive and really added to the official feel of entering Spy School – the kids have also enjoyed playing with it since. Brilliant! Once the boys get a little older this will be perfect! This is amazing, what a wonderful mummy you are. I think you clever babyccino girls should do a party tab on the site. Esther’s party ideas are also inspired and Courtney’s so pretty! Thank you Rachel – what a sweet comment! This is such a brilliant and fun idea!